​The mission of Therapy Animals of Utah is sharing the comfort, love, hope and healing of the human-animal bond through training, service, education, and research. Volunteer service of our members to people in physical and mental health treatment, rehabilitation, short and long term care facilities, shelters, libraries, schools, and other settings. Community education concerning the benefits of animal-assisted interactions and the human animal bond through public presentations, special event booths, and media appearances. Special research projects and partnerships with educational institutions or human health professionals to explore the potential of animal-assisted therapy and other aspects of the human-animal bond. We value respect, service, quality, and the integrity of mutually beneficial relationships. In all that we do, we will demonstrate that every person and animal has value and is worthy of respect. We believe that service to others is a worthy and valued endeavor. We will never compromise our standards or the quality of service we provide to our volunteers, our clients, and the community. We will consistently promote and share the love and healing power of animals in an ethical and mutually beneficial manner. ​We envision a world where animals are highly valued as teachers, healers and essential contributors to human health and well-being. 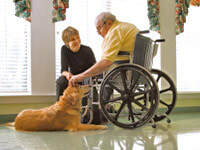 TAU Pet Partner teams currently serve in facilities from Cache to Utah County. Members volunteer their time at hospitals, nursing homes, mental health facilities, schools, and libraries, as well as special service and public education events. Click here to view the current list of facilities being served. ​Click here to view our 2014 Activities Report.